Note: you should not follow any of these processes if you are teaching a regular Bear Tracks credit section! 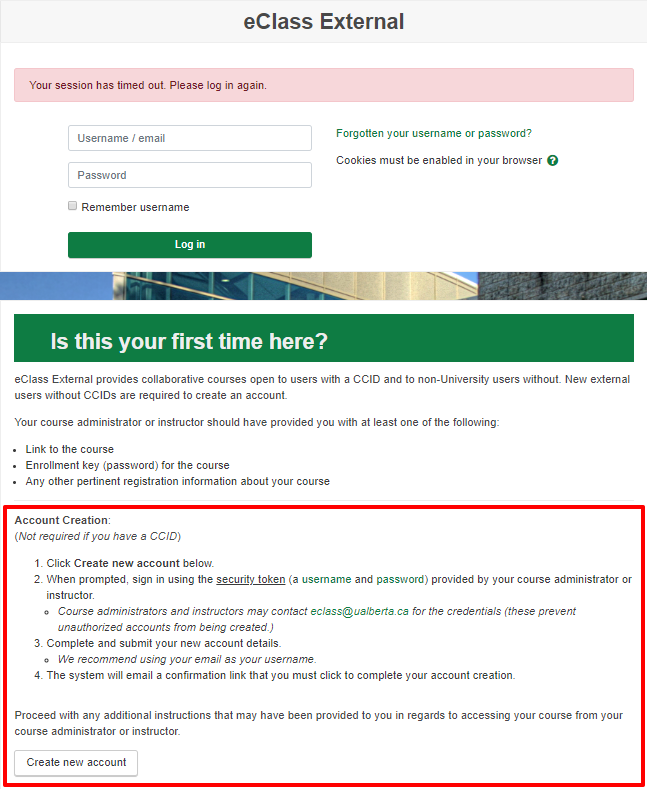 To create a new course, please go to https://cc.elearning.ualberta.ca/ and select 'External courses' on the Course Type phase of the request process. You can select content copy just as you normally would for regular eClass courses (including content from the Blackboard Vista CPD archive. You will need to have users create their own accounts on the eClass External system if they do not have a CCID. Instructions on how to do this are listed on the bottom half of the login page. Once new users enter the credentials to access the account creation page, they will be required to enter a username, password, email address, first and last name, and location. Users can sign in using either their email address or their username. Once their account is created, you need to enroll them in your course. You can do this manually within your course; or you can enable self-enrollment in your course and send your users the URL for the course. With self-enrollment, you also have the option of including a course enrollment password. If you are unable to find a CCID user when manually enrolling users, it may be because not all CCID users will automatically have their account synced onto the External system. The quickest and easiest method of syncing their account is for the user to log into External at https://eclass-cpd.srv.ualberta.ca/login/index.php with their CCID and password. When the CCID user first logs in, the system will automatically sync their account to eClass External, and his or her name will then be available for you to enroll in the course. If you have any questions about the eClass External service, please contact us at eclass@ualberta.ca .